With increasing oil prices and a tightening labor market, United's stock price rally could be coming to an end. Despite revenue and PRASM growth, operating margins have continued contracting. With the recent grounding of the Boeing 737 Max airplanes, we could see a significant miss of expectations in the coming quarters. United Continental (UAL) is considered to be one of the four biggest U.S airlines. UAL finished 2018 24% higher, but since July 2018, the stock has been hovering around $80-84 per share. The company appears to have had a very good fourth quarter, but is there sufficient underlying value? United Airlines is a major American airline which operates a large domestic and international route network, with an extensive presence in the Asia-Pacific region. United is a founding member of the Star Alliance, the world's largest airline alliance with a total of 28 member airlines. The company has approximately $41,303 million in annual revenue and employs over 88,000 people. As of today, UAL has returned to margin expansion (on an adjusted cash basis) and implemented customer enhancements to de-stress the customer travel experience. In the next 2 years, I expect increased revenue growth offset by upward salary pressure and increasing oil prices. Although we have seen increasing operating metrics in recent years, I expect the uncertainty around oil prices and the tightening labor market to negate their effect. Considering all this I find UAL's share price today too expensive for my taste. One of the strongest catalysts for profitability in the industry is the price of oil. Right now U.S. oil prices are recovering after a drop driven by U.S. inventories reaching a five-month high of 432 million barrels in October last year. According to EIA, due to a slightly tighter global oil market, the US Energy Information Administration, in its latest Short-Term Energy outlook, forecasts Brent spot prices to average $65/bbl. in 2019, up $2/bbl. from last month's STEO forecast, and $62/bbl. in 2020. These compare with an average of $71/bbl. in 2018. Crude oil prices are continuing their increase since the beginning of the year. Increasing crude oil supply disruptions and voluntary reductions in oil production from the Organization of Petroleum Exporting Countries are among the recent price drivers in the crude oil market. According to the EIA by 2025 the average price of a barrel of Brent crude oil will rise to $81.73/b (figure is in 2018 dollars, which removes the effect of inflation). 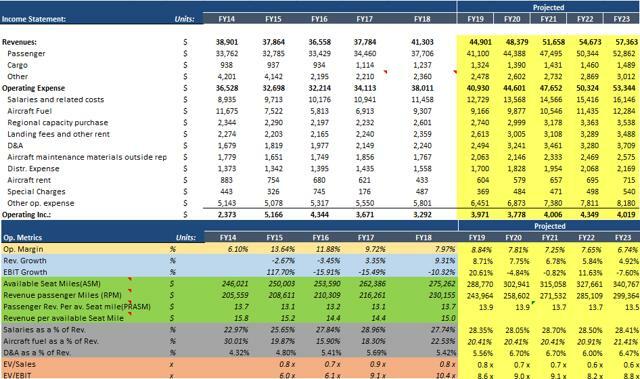 According to UAL's earnings call, they are confident they will meet or exceed their $10 to $12 EPS guidance in 2019 for any fuel price between $40 and $80 per barrel. The International Air Transport Association reported in February 2019 that total base fare yields have trended downwards in seasonally adjusted terms over 2018 and are currently about 4% lower compared to the same period a year ago. Premium-class yields trended upwards as airlines were able to partly recover rising fuel costs in this less price-sensitive segment of the market. Passenger demand ticked up, but capacity is growing faster than demand. Industry-wide revenue passenger kilometers (RPKs) started 2019 on a positive note, increasing by 6.5% year-on-year. The seasonally adjusted upward trend in RPKs also ticked up slightly this month. Despite all this capacity has been outpacing demand. Capacity has now risen at an annualized rate of around 5.5% since mid-2018 - around 1 percentage point faster than overall demand over the same period. In February 2019 IATA released a report which stated that the latest Q4 2018 financial data indicate that the intense squeeze on industry-wide airline profitability has moderated in the final quarter, with North American carriers seeing much smaller declines in EBIT margin compared to Q3 and Q2. Although rising base fare yields, the downwards trend remains in place. Airlines have been able to offset some of the previous rise in fuel and other costs with the less price-sensitive premium cabin yields. 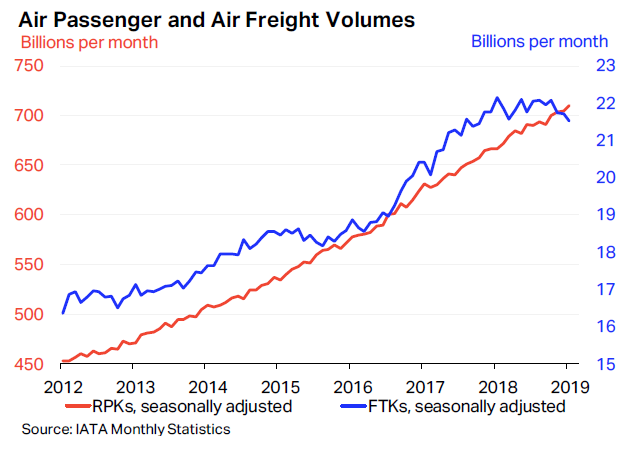 Passenger demand has also seen an increase with seasonally adjusted volumes and year-on-year growth going up modestly. With another release on April 2019, IATA reported weakening corporate travel. 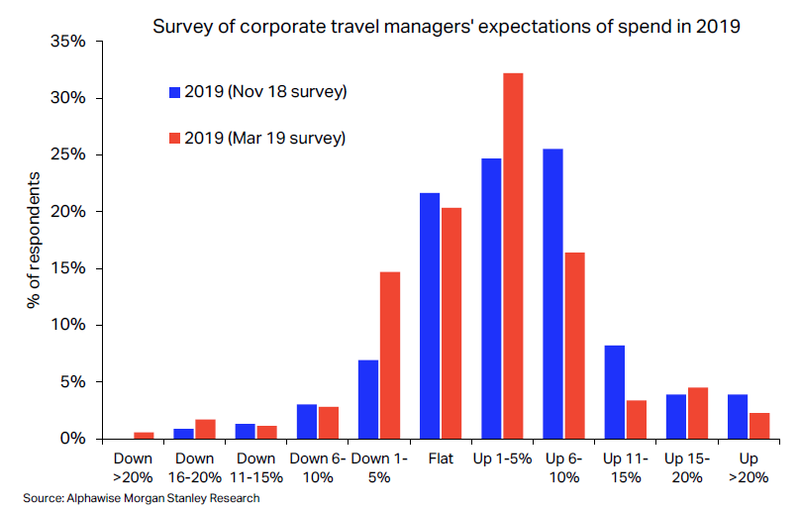 According to the latest Alphawise Morgan Stanley survey, corporate travel shows a weakening of planned travel spending in 2019. Back in November, more than 50% of travel managers were expecting to increase spending by 1-10% in 2019. The mode of the distribution shifted left (weaker growth) in the March survey, with over 50% now expecting flat to 5% spending in 2019. With airlines recovering part of the rise in costs through higher fares in the front cabins, such a decline could present a problem. Passengers buying premium tickets are only 5% of passenger count, but they represent 30% of ticket revenues on international markets - so they are a critical driver of passenger yield for airlines. UAL recorded Q4 18 revenue of $10,491 million, representing a yearly growth of 11% for the quarter. Operating income was $652 million, representing a yearly decline of 47%% and quarterly decline of 46%. The decrease in numbers in the Q4 report were mainly due to the 32% increase in Salaries and 27% increase in aircraft fuel compared to the Q4 2017 numbers. As you can see from the chart below there is a decrease in operating margin mainly due to the 4% increase in pilot raise. On April 10th, United announced more flights and more opportunities for customers to connect between Washington, D.C., and Florida. Starting in October this year the company will begin a twice a day year-round service between Washington Dulles and Fort Myers and Sarasota in Florida. Additionally, United will begin operating extended seasonal winter service between Miami and Washington Dulles starting two months earlier than originally planned in October 2019. In addition to this service, United Airlines operates more than 140 daily flights to 12 Florida cities. Such a move will extend UAL's footprint in the industry reaching a bigger clientele. Expedia (EXPE) filed a lawsuit on February against United, alleging that United could pull its flights off the Expedia website. In the suit, Expedia claims that United is using its weight as one of the biggest U.S. air carriers to renegotiate its contract with Expedia. Or in other words, Expedia accused United of trying to force a renegotiation of their 2011 contract by threatening to stop working with them. On April 5th a U.S. judge in Manhattan rejected Expedia Inc's request for an injunction that would have required United Airlines to continue providing fare data for flights after Sept. 30, when the companies' contract ends. This is actually great news for UAL since many airlines now rely on direct booking. With the improved United mobile application and better focus on customers, United is positioning itself well to provide a better direct customer experience. United Airlines is one of the biggest airline companies in the U.S. with the oldest fleet. The company's oldest planes are 38 Boeings 767-300ER with an average age of 22.9 years and 56 Boeings 757-200 with an average age of 22.8 years. Based on data from Airfleets, United has the 2nd oldest fleet, with Delta Air Lines (DAL) having a fleet average age of 15.6 years, and Southwest (LUV) an average age of 11 years. So how old is too old, and will UAL have to soon renew their fleet? According to a report, one of the major factors for a plane to retire is fuel burn. Another one is efficiency. Older airplanes are far less efficient than newer models, and, at some point, replacing parts no longer makes financial sense. According to a report on "How old is too old for a commercial airplane" in Travel Pulse the age of 24 is pushing an airplane's lifespan. Beyond that age usually, the repairs are costlier than the value brought. In the last earnings call on January 16, 2019, United announced exiting some of their oldest aircraft types, Airbus A320s and Boeing 757. During the month of December, the company ordered four additional Boeing 777-300ER aircraft. These aircraft are highly efficient for routes that have demand for large premium cabins, this is good news for UAL since the premium class cabins yields are trending upwards. During January 2019, UAL finalized an order for 24 additional Boeing 737 MAX aircraft, with deliveries beginning this year. In March 2019, airlines and governments around the world grounded the Boeing 737 MAX passenger airliner after two crashes of the aircraft within five months killed all 346 people on board both flights. On October 29, 2018, Lion Air Flight 610 crashed into the Java Sea twelve minutes after takeoff with 189 passengers and crew. On March 10, 2019, Ethiopian Airlines Flight 302 crashed six minutes after takeoff with 157 passengers and crew. On March 13th this year, United followed the FAA's order and also grounded their 14 Boeing 737 MAX aircraft. On April 9th, United announced using larger aircraft on 737 MAX routes is costing them more money. The company has been using its larger 777 or 787 aircraft to cover routes formerly flown by the suspended MAX planes, without being able to fill the extra last-minute seats. This will cost United money and will surely negatively affect their Q1 earnings for 2019. As we can see from the income statement below, Revenue has grown steadily in the last three years with a CAGR of 4.15%. In 2018 we see a definitive increase in revenue growth by 9% while at the same time UAL has increased supply, the growth in revenue is driven mainly by a strong PRASM improvement each quarter. For the years ahead I presume an average increase of 6.8% per year is pretty fair. The revenue growth is accompanied by a modest growth in both ASM and RPM which numbers are correlated to the revenue growth. I also presume in the years ahead that the company's RPM numbers will approach their ASM numbers as they reach their full capacity and improve their customer's experience. As we can see for the last three years, salaries a % of Rev. has not changed much, this is mainly due to reducing functions in 2016, optimizing overall performance and keeping M&A total headcount flat in 2018. I have presumed only a slight increase in salaries as a % of revenue. According to IATA's report, 48% of respondents report that finding new talent is a challenge, both because of the lack of availability of candidates with the right skill levels and qualifications as well as, in some cases, salary demands of new applicants. Aircraft fuel as a% of revenue has started increasing in the last three years mainly because of a recent recovery in fuel prices discussed above. I presume only a slight increase as fuel prices continue to recover slowly in the coming years. We can see that operating profit margins have declined in recent years mainly driven by fuel prices. For 2019 I predict an increase in operating margin around 8.5% and a decline in the coming years mainly driven by increasing fuel prices and tightening labor market. In December last year, United announced their largest international route expansion. The airline will offer Bay Area customers nonstop year-round service to Toronto and Melbourne, Australia and seasonal service to New Delhi. The company also announced a second daily flight between San Francisco and New Delhi. In addition to these in 2019, United will begin a year-round nonstop service between San Francisco and Auckland, New Zealand, Tahiti, French Polynesia, and Amsterdam. This expansion will help united solidify its position in San Francisco and expand its footprint across Europe and Asia. On April 10th this year, according to a report in Travel Pulse, United announced another expansion, a brand new service between New York/Newark and Prague, as well as the only nonstop service between the United States and Naples, Italy. The expanded international schedule connects 54 countries to hubs in the United States. In December 2018 IATA forecasted global airline industry net profit to be $35.5 billion in 2019, slightly ahead of the $32.3 billion expected net profit in 2018 and passenger numbers are expected to reach 4.59 billion (up from 4.34 billion in 2018). All this is mainly driven by lower than expected oil prices and solid economic growth, which are offsetting the increased expenses for salaries. Passenger traffic is expected to grow by 6% this year which will outpace the forecast capacity (ASKs) increase of 5.8% and remains above the 20-year trend growth rate. This, in turn, will increase load factors and support a 1.4% increase in yields (partially clawing back the 0.9% fall experienced in 2018). With only a small increase in fuel prices and salaries while keeping capital expenditure as a % of revenue flat at 9.7% (this is about the average for the last 2 years) we calculate an implied share price in the $75- $85 range. 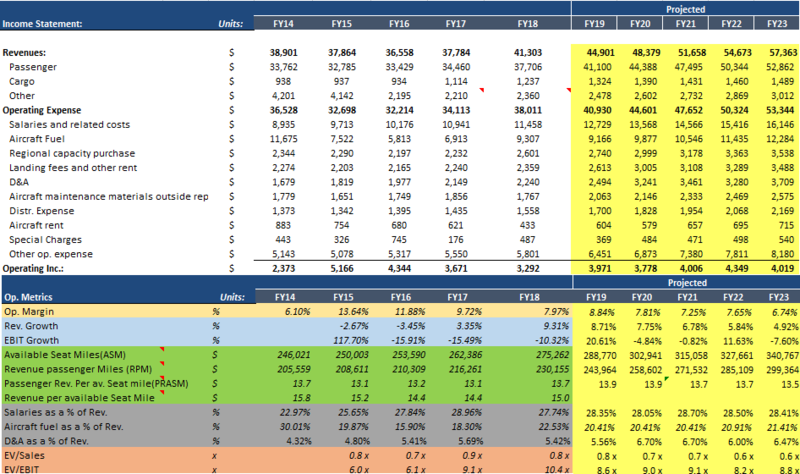 This is the range if revenue grows at a CAGR of around 5% for the next 5 years and costs increase as shown above in the income statement breakdown. Considering all risks and catalysts I believe this is an optimistic forecast. There are many uncertainties surrounding oil prices, the labor market, and new plane acquisitions. Keep in mind UAL's fleet is one of the older ones in this industry. I have valued UAL using public comps and a DCF analysis. The DCF analysis major driver is salaries, fuel costs, and revenue growth. 6.5% discount rate (based on public comps and WACC), 2.0% terminal FCF growth rate, and standard discount periods. Within comparable public companies, I have included companies with a similar market cap: Delta Air Lines, American Airlines (AAL) and Southwest. Within all the comparable companies UAL is trading at the lowest valuation. Although the company is trading at the lowest multiples, operating margin is also one of the lowest from its peer group. 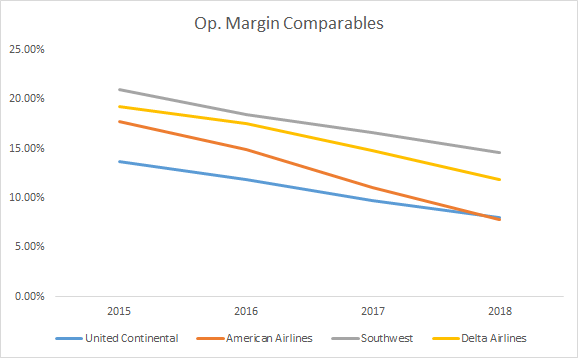 Southwest right now has the highest margin mainly driven by strong performances in both passenger revenues and other revenues. According to IATA's report, the industry-wide passenger load factor was essentially unchanged in January 2019 from the same period a year ago, at 79.6%. 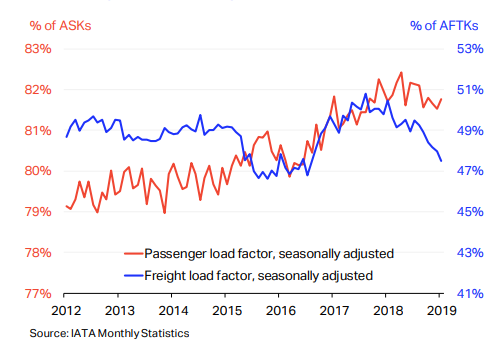 In seasonally adjusted terms, the load factor ticked-up slightly this month, although the modest downward trend since early-2018 remains in place, as capacity growth has outpaced passenger demand. If the load factor continues its decrease we could see an impact on United's revenues. If that couples with higher oil prices the share price could drastically go into a downwards trend. According to a report, the number of Americans filing applications for unemployment benefits dropped to a 49-1/2-year low last week. Initial claims for state unemployment benefits fell 8,000 to a seasonally adjusted 196,000 for the week ended April 6, the Labor Department said. That was the lowest level since October 1969. Considering this I would expect salaries to rise and if the trend continues we could see UAL reporting increased expenses, reducing their profit margins even more. Since January this year oil prices have been soaring, due to a number of risk factors such as OPEC-led supply cuts, U.S. sanctions on oil exporters Iran and Venezuela and escalating fighting in Libya. Brent and WTI crude futures have risen by approximately 30% and 40% respectively since the start of the year. With many uncertainties surrounding the market Tamas Varga, senior analyst at PVM Oil Associates said, "It's virtually impossible to predict developments for the rest of the week let alone for months or a year ahead,"
In considering all catalysts and risks, I do see growth in the company, but also many risks and uncertainties surrounding it. 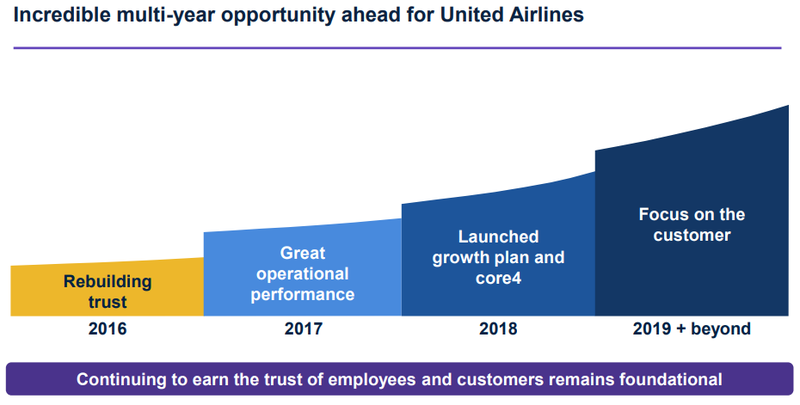 With volatile oil prices, passenger volume going down recently and a tightening labor market, we could see UAL struggling to bring greater value to its investors.